Even if it is generally accepted that competition between states to see who can dole out more subsidies is an unhealthy form of state competition, action is not easily taken. Careful consideration must be given to what reforms might be taken, particularly in the context of today’s political environment in which states are encouraged to compete in this deleterious way. An immediate and obvious solution for a state is to simply stop handing out subsidies. But the political gain to be had by handing out a subsidy, which allows policymakers to take credit for a company relocating to the state or an expansion of an existing facility — even if the subsidy had nothing to do with it at all — is hard for any policymaker to resist. This is because the opportunities that are foregone because the subsidy was awarded — the capital investment that did not happen in a company that did not receive the subsidy or a job that was not created somewhere else in the state — remain unseen by the public at large. This is true although the economic benefits of lost opportunities are likely larger than the benefits that result from the subsidy, resulting in a net loss. In the end, the opportunity for good press for a policymaker trumps all the net negatives of a bad policy. Due to the political calculus just described, it is difficult for any coalition of policymakers to “unilaterally disarm” their state in the subsidy battle even when there are demonstrable benefits to doing so. If a group of states decided to simultaneously disarm, on the other hand, then as long as all could make a credible commitment not to renege on the deal, everyone would be better off. This is what is known in game theory economics as a “collective action problem.” Every player would be better off with the outcome in which everyone was disarmed, but nobody is willing to make the first move in that direction for fear that they would be worse off if other players do not follow suit. This same collective action phenomenon exists with international trade. The government of a nation can capture the political benefit of sheltering a particular industry with trade barriers, usually in the form of tariffs on imports, even though citizens of all nations would benefit from free trade with low or no tariff barriers. A high tariff on a good benefits that good’s producers in the nation with the tariff because other countries’ product are made artificially more expensive for consumers in the tariff-imposing country. If states were able to charge tariffs against other states, they could do so in the name of protecting and developing homegrown industries and jobs. In a very real sense, giving tax preferences and subsidies to certain companies but not others is a form of trade barrier not unlike tariffs. Instead of favoring an industry by increasing costs for its competitors, states artificially lower costs for the industry that locates within its borders. Just as a tariff favors one good or industry over another, so do state government grants and tax subsidies. The authors of the U.S. Constitution were quite aware of the problems inherent in states erecting barriers to trade between them. It was a very real problem during the period of the Articles of Confederation when states sometimes charged tariffs on goods purchased from other states or imposed tariffs on imports that crossed their borders but were purchased in other states. At the time, states could erect their own tariff barriers against international imports, especially from Britain. Citizens could get around these by buying the same goods from other states with low tariffs, so state-to-state trade barriers were erected. This problem was ultimately solved through the Commerce Clause in the U.S. Constitution, which gives Congress the exclusive power to regulate commerce among the states. Congress quickly enacted prohibitions against state-to-state tariffs after ratification of the Constitution. In so doing, they created the geographically largest free trade zone at the time. This policy contributed to the rapid economic rise of the United States because states could economically specialize according to economic realities and real innovations, uninfluenced by artificial costs like tariffs. In international trade, collective action problems related to tariffs have been solved to some degree through bilateral and multilateral treaties between nations, the conditions of which require the lowering of trade barriers. Enforcement mechanisms for such treaties range from fines issued from an international adjudicator — in this case, the World Trade Organization — or by a “countervailing duty” which is a tariff that can be imposed on the imports from a nation that has been proven to violate the terms of the treaty or agreement. No matter how the treaties are structured, they all have the same goal: to make free trade the default policy, not the exception. The same mechanism and logic can apply to a “cease-fire” agreement between the states concerning corporate welfare. Interstate compacts (contracts between states that are allowed under the constitution) could reboot healthy competition between states and codify a discontinuation of corporate welfare subsidies, especially those intended to further one state’s economic interests over another’s. A compact in and of itself may not completely solve the collective action problem, since no one state or small number of states will agree to end all corporate welfare subsidies while others continue to offer them. 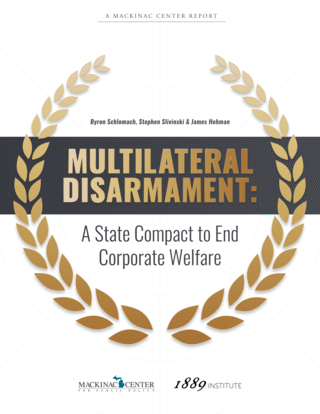 To encourage states to join the compact, it must contain within it a provision prohibiting compacting states from competing with each other through corporate welfare schemes. However, compacting states could still compete in this way with states that have not entered the compact. It’s also important to note that this compact would have built into it a provision that could be described as a “we jump when we all jump” provision. That is to say the cease-fire would only kick in when a threshold number of states enter the compact. Not only will this create a bigger “free trade zone” within the compact and consequently increase its likely effectiveness at achieving the desired results, but it would also avoid what may be called the “chump problem” — a situation in which only a few states join the compact, but because the provisions are in force immediately, feel like chumps for doing so. This increases the likelihood of those states terminating the compact and extinguishing the promise such a compact could provide over the long term. In order to end nearly all corporate welfare that acts like barriers to trade, all states would have to be prohibited from doing so through an act of Congress under authority of the U.S. Constitution’s Commerce Clause. To accomplish this, the compact could contain a trigger that activates it when enough states have signed on to constitute a three-fifths majority in the House and Senate, enough to ensure a successful cloture vote in the Senate. The trigger could prohibit all compacting states from handing out corporate welfare, regardless of what nonsignatory states do. This would create an immense pressure on a significant majority of Congress to exercise its legitimate constitutional duty and legislate a stop to corporate welfare competition between the states. With this formulation, states could adopt the compact without concern that it will kick in for a little while, which solves a potential hurdle to adoption by a state. Congressional action to short circuit the sorts of unhealthy state competition outlined in this study could still occur even in the absence of a compact. Action by the courts could also resuscitate the U.S. Constitution’s Commerce Clause. For instance, a 2004 decision by the Sixth Circuit in the case of DaimlerChrysler v. Cuno struck down a tax credit that allowed the expansion of their facilities in Ohio as a violation of the Commerce Clause because it, by definition, discriminated against interstate commerce. That decision made a very strong statement that what legal scholars refer to as the “dormant Commerce Clause” would preclude such a tax credit because it had the effect of favoring in-state expansion over other types of economic activity that might involve movement of capital and jobs to another state. Unfortunately, the U.S. Supreme Court negated the applicability of this decision after it ruled that claimants lacked standing necessary to bring their case. Because states do not have a viable way to register their preference for a cease-fire in the state subsidy war, there is little incentive for Congress to act or for states to discontinue their subsidy activities on their own individually. The mechanism of a state compact would provide such a way to not only register this preference — which is made possible because each state could be assured others would eventually follow suit — but also send a message to Congress that they must reassert their power to legitimately regulate commerce between the states in a way that benefits all through the Commerce Clause power. A state compact that has built within it an activation trigger that kicks in when a specific share of the population is covered by it would provide the signal necessary for members of Congress to understand that it is politically possible — indeed, perhaps even vital — for Congress to put a stop to discrimination against interstate commerce. One objection to the proposed compact is that Article I, Section 10 of the U.S. Constitution stipulates that states need congressional consent to create compacts. This consent, however, according to nearly 200 years of Supreme Court case law, can be provided after the compact is created and can be done so implicitly. In addition, legal precedent has established that congressional consent is not necessarily needed if the interstate compact does not impact the delegated powers of the federal government. The proposed interstate compact would avoid this pitfall because it would only exercise the member states’ own sovereign control over its taxing and spending policy. Tightly defines corporate welfare subsidies and prohibits compacting states from engaging in such competition with each other. Provides that any compacting state may withdraw at any time prior to the supermajority congressional provision being satisfied, but prohibits withdrawals after the satisfaction of the supermajority provision. Communicate to Congress that it should act to prohibit corporate welfare at the state and local levels when a trigger number of states has joined the compact. The language in the model legislation proposed here can also be modified, particularly if the goal is to short circuit specific types of adverse competition. For instance, job training programs could be excluded from the definition of subsidies as long as they are generally available and do not include language that discriminates against specific sorts of employment. In any case, the purpose of this compact is to set up an agreement where all states benefit from the removal of the current destructive incentives to practice mercantilism. The outcome would essentially mimic the environment that would exist if the Commerce Clause was suitably interpreted to rule out present forms of discriminatory economic competition. In essence, it would recreate the truly free-market relationship between the states the Commerce Clause was intended to foster. Consistency in the language of the compact adopted by each state is key, however, as it would be in any treaty or other type of compact and should be settled at the outset before any state began to debate any version of the compact. [*] This latter condition is important since the U.S. Supreme Court refused to hear an appeal of the Cuno decision on the grounds that the plaintiff did not have standing. This refusal to hear the case amounted to a missed opportunity to solidify important elements of dormant Commerce Clause jurisprudence and set a workable standard and rules within which states could compete on a forward-going basis.